ResDiary has partnered with AfternoonTea.co.uk, the UK and Ireland’s leading promoter of afternoon tea, to help maximise your afternoon tea business, by reaching the widest possible market. AfternoonTea.co.uk is the UK & Ireland’s most popular website dedicated to promoting afternoon tea in hotels and restaurants. They also are the founders and operators of Afternoon Tea Week and The Afternoon Tea Awards, now established as the gold standard in recognising Afternoon Tea service. 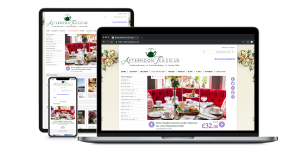 This partnership will allow ResDiary customers to take bookings through AfternoonTea.co.uk, gain access to over 3 million website visitors each year and to their customer database of 275,000. AfternoonTea.co.uk dominates natural search engine rankings for all ‘Afternoon Tea’ related keywords and phrases in Google, Bing, Yahoo, Ask and AOL search engines. Meaning it’s the place to be to have your afternoon tea offer seen. Their seasonal marketing campaigns focus on delivering more covers to your restaurant when you need them – for popular occasions, such as Valentine’s and Mother’s Day, as well as during quieter periods like January and August. The statistics speak for themselves: £7 million worth of afternoon teas booked this year and over 3 million website visits per year. AfternoonTea.co.uk can use their expertise and marketing options to help deliver additional afternoon tea covers to your restaurant. Getting onto AfternoonTea.co.uk is easy. All you need to do is join ResDiary’s Affiliate Partner Network* . The network offers a way to drive incremental bookings through a selection of trusted partners, like AfternoonTea.co.uk, with all availability fully controlled by you. To get started just fill out our quick and simple form. *There are no listing fees to feature on our partners’ websites. There is a booking fee of £/€ 2 + VAT per cover for bookings dined from the partners.